Gen Xtinct: If they've got a blue space monkey with them, we're outta here. If they've got a blue space monkey with them, we're outta here. 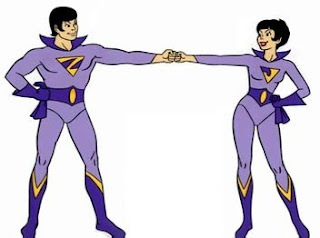 According to an article in TIME from last year, some people actually point to the Wonder Twins' power-activating gesture as the first national use of the fist bump. Right. And Black Vulcan discovered electricity. For plenty of clips of this not-so-dynamic duo -- and some excellent snark -- check out Seanbaby's Wonder Twins "tribute."